Intracytoplasmic sperm injection (ICSI) has revolutionized the treatment of male infertility and enabled men to become biological father despite severe testicular damage or obstruction. In today's scenario, almost 18-20% in vitro fertilization (IVF) cycles are done for severe male factor in every center. While IVF-ICSI had always been proved to be costly treatment, most couples have opted for artificial insemination donor (AID) as cheaper means especially in poorer segment of our country. The additional expenditure is mainly due to use of high dose of gonadotrophins in order to get more number of eggs from otherwise normal healthy wife. To cut down the cost, low dose or mild stimulation protocol have been popularized all over the world in last few years. Use of aromatase inhibitors along with low doses of gonadotrophins have been an effective means of mild stimulation protocols for IVF cycles. Aromatase inhibitor had always been focused as an effective means of ovulation induction in the management of infertility. ,,, Letrozole, a highly selective, nonsteroidal aromatase inhibitor, could successfully induce ovulation in women with polycystic ovary syndrome (PCOS)  including even those who were resistant to clomiphene citrate. Several studies demonstrated that addition of letrozole improved ovarian response to FSH and reduced gonadotrophin dose required for COH in women with unexplained infertility , and in poor responder. A significant reduction in the total dose of gonadotrophins was found when aromatase inhibitor was added in COH cycles. Most recently, Verpoest et al., in a pilot study demonstrated that administration of letrozole increases LH concentration which can be taken care of by adding antagonist from day 6 and thus preventing premature LH surge and simultaneously increases endogenous FSH concentration which contribute to normal implantation and follicular response without having negative antiestrogenic effect. These reports prompted us to hypothesize that adjunctive use of letrozole in COH + GnRH-antagonist protocol would minimize the gonadotrophin dose, and consequently the cost, of an IVF-ICSI treatment cycle and will help to prevent OHSS particularly in women where male factor is the sole indication going for IVF treatment. The present investigation is an endeavor to evaluate the potential of letrozole- gonadotrophin combination therapy as a low-cost stimulation protocol in male factor infertility. This randomized single blind controlled trial was done at ART unit of Institute of Reproductive Medicine Kolkata, India from January 2009 to December 2010. Approval by the Research Ethics Board of the Institute was obtained for the use of letrozole for ovarian stimulation and subsequent induction of IVF. A total of 94 women between 25 and 35 years of age without any demonstrable cause of infertility, whose husbands were suffering from azoospermia were chosen for IVF-ICSI following TESA. All women were euthyroid, normogonadotropic, normoprolactinemic, without PCOS and endometriosis. They were randomized by sealed envelope into two groups, viz., Group A includes 42 women who received Letrozole (Letroz, Sun Pharmaceuticals, Mumbai, India) 5 mg daily from D3 to D7 along with recombinant FSH 75IU (Inj. Gonal F, Merck Serono, Switzerland) from D5 onward till trigger by hCG and Group B includes continuous recombinant FSH 150- 225IU from day 2. TVS folliculometry performed after 5 days of stimulation and subsequent dosage of gonadotrophins were adjusted accordingly. Women in both the groups received antagonist 0.25 ml S/C (Inj. Orgalutran, MSD, India) when lead follicle become 14 mm till trigger by hCG. Trigger by hCG 10.000 IU (Pregnyl, MSD, India) when lead follicle become 18 mm in both groups. Serum E2, LH, P4 measured on day of starting of stimulation, day of initiation of antagonist and day of trigger. Oocytes were retrieved by transvaginal ultrasonography, 34-36 h after HCG administration. The retrieved oocytes were denuded and their qualities were assessed. Matured MII oocytes were fertilized by ICSI with spermatozoa of the husband retrieved by TESA. Two embryos were transferred in each group at 40-42 hours following insemination at 4-6 cell cleavage stages. All patients received 600 mg micronized progesterone (Utrogestan; Laboratories Besins International, Paris, France) intravaginally daily until a pregnancy test was performed, and if the test was positive, progesterone treatment was continued up to 12 gestational weeks. Clinical pregnancy was defined when an ultrasound scan, performed 5 weeks after embryo transfer, revealed the presence of a viable fetus. Serum levels of LH and FSH were measured by a two-site chemiluminescent sandwich immunoassay system (ACS:180; Bayer Diagnostics Corporation, Tarrytown, NY, USA). All samples were assayed in duplicate. The LH and FSH values were expressed in terms of the reference standards (WHO 2nd IS 94/632 and WHO 2nd IS 80/552, respectively). Assay sensitivity for FSH was 0.3 mIU/ml and for LH was 0.07 mIU/ml. E2 levels were assayed by fully automated enzyme-linked fluorescence assay system (Vidas; bioMerieux, Marcy l'E΄ toile, France). The minimum detection limit was 9 pg/ml. The intra- and interassay coefficients of variation were 3.46% and 4.82% for FSH, 4.4% and 5.6% for LH and 4.2% and 5.2% for E2, respectively. The primary outcome measure was comparative evaluation of pregnancy outcome, while additional measures included total dose of rFSH administered, the number of mature follicles, the levels of terminal E2, number of oocytes retrieved, endometrial thickness and transferable embryos. Statistical comparisons were performed using Student's t-test and Fisher Exact test by SPSS 11 software as applicable. P < 0.05 was considered to be statistically significant. All patients were euthyroid and normoprolactinaemic, and both groups were comparable with respect to all baseline clinical characteristics [Table 1]. The composite results on treatment outcome are summarized in [Table 2] and [Table 3]. According to the set criteria, all patients got GnRH antagonist as flexible protocol when dominant follicle diameter reaches 14 mm. Compared with the control i.e., continuous rFSH group, the study i.e. Letrozole + rFSH group had an, 64% reduction of (P = 0.0001) total dose of rFSH requirement (Let-rFSH 625 ± 98 IU/cycle versus continuous rFSH 1756 ± 75 IU/cycle), and had significantly (P = 0.0001) decreased levels of terminal E2 (Let-rFSH 830 ± 36 pg/ml versus continuous rFSH 1076 ± 41 pg/ml). However, the two groups did not differ significantly with respect to the numbers of matured follicles (Let-rFSH 6 ± 0.46 versus continuous rFSH 6 ± 0.41), the numbers of retrieved oocytes (Let-rFSH 4.6 ± 2.5 versus continuous rFSH 4.9 ± 2.3) and numbers of transferable embryo (Let-rFSH 3.5 ± 1.6 versus continuous rFSH 3.7 ± 1.7). Endometrial thickness (mm), on day of hCG, was significantly (P = 0.0008) increased in study i.e. Letrozole + rFSH group (Let-rFSH 9.1 ± 0.32 versus continuous rFSH 8.7 ± 0.69) as also the LH level (P = 0.001) on day of initiation of antagonist (Let-rFSH 4.4 ± 2.1 versus continuous rFSH 3 ± 1.9). There was no case of drop-out from either of the groups. The pregnancy rate (Let-FSH 36% versus continuous rFSH 33%) though increased in study group but remain statistically indifferent than control. Similarly miscarriage rate (Let-FSH 19% versus continuous rFSH 25%) and multiple pregnancy rate /stimulated cycle (Let-FSH 7% versus continuous rFSH 17%) though decreased but remained statistically indifferent. The study group i.e., Let - rFSH had significantly (P = 0.01) reduced the risk of incidence of hyperstimulation compared with the control group (Let-FSH nil versus continuous rFSH 7 ). Average cost per cycle was reduced by 34% in Let-FSH group in comparison to continuous rFSH group [Figure 1]. Treatment with letrozole was well-tolerated, with no apparent side effects. 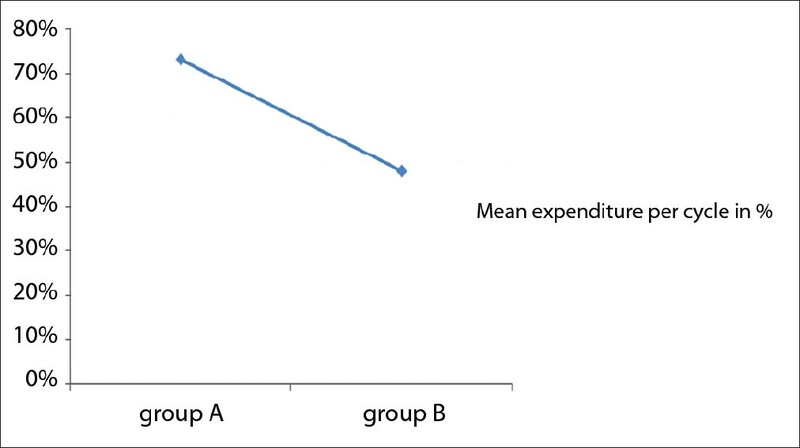 Figure 1: Mean expenditure per stimulated cycle till transfer in between two different groups for COH + GnRH antagonist protocol: Group A received letrozole + rFSH, group B received rFSH [Average cost per cycle was reduced by 34% in Let-FSH group in comparison to continuous rFSH group (Let-FSH group Rs 48173/- versus continuous rFSH group Rs 73411/-)]. The success of aromatase inhibition by letrozole in inducing ovulation in anovulatory women with PCOS  and augmenting ovulation in ovulatory women in unexplained infertility  has been reported previously. It has also been shown that when letrozole is used with FSH, a significant reduction occurs in the FSH dose needed for COH. The successful use of letrozole in increasing ovarian sensitivity to gonadotrophins by increasing intra-ovarian androgen in low responders  prompted us to evaluate the potential role of letrozole-FSH combination in achieving successful IVF outcome in women with normal ovarian response where azoospermia was the sole indication go..in,,g for IVF-ICSI. Since last Cochrane review (2009), GnRH antagonist protocol was proved to be a short and simple protocol with good clinical outcome with significant reduction in incidence of severe ovarian hyperstimulation syndrome and amount of gonadotrophins requirement. We planned to collaborate letrozole-FSH with antagonist protocol to get maximum benefit in reducing gonadotrophin dose and incidence of OHSS. It is of particular importance to note that despite 64% reduction of total dose of rFSH in the Let-rFSH group, which entailed significant reduction of the cost of treatment, the outcomes in all major aspects including pregnancy rate were comparable between the groups. This part well corroborated with studies done by Mitwally and Casper, between 2002 to 2004 ,, where they achieved at about 45-55% reduction of gonadotrophin requirement in COH cycles. Our observation on significant reduction of terminal E2 level also well corroborate with contemporary pilot studies done by Verpoest et al.,  and Garcia-Velasco et al. These findings were consistent with the hypothesis that aromatase inhibitors, by blocking androgen conversion, increases intraovarian androgen and FSH receptors gene expression , which leads to increased FSH sensitivity to exogenously administered FSH or stimulate insulin-like growth factor-I, which may act in synergy with FSH. , Also because of selective inhibition of aromatase, letrozole significantly inhibits the overall production of estrogens, which was reflected in the decreased levels of terminal E2 in the Let-FSH group. Consequent withdrawal of the negative feedback effects of estrogens may allow the pituitary to produce more endogenous FSH. All these effects have phenomenal importance in the letrozole-mediated promotion of follicular maturation. Our observation about LH level, which was significantly (P = 0.001) increased in study i.e., Let-FSH group on day of initiation of antagonist corroborate well with study done by Verpoest et al. which was efficiently controlled by antagonist administration. Mean endometrial thickness (mm), on day of hCG, which was significantly (P = 0.0008) increased in study group also correlates well with the observation of Verpoest et al. And that contribute to normal implantation without having negative antioestrogenic effect. However, numbers of matured follicles, retrieved oocytes and transferable embryos were not statistically different between study and control group in this study. These findings does not match with the findings of Garcia-Velasco et al.,  where they found a higher number of retrieved oocytes in Letrozole group. The difference could have been due to their chosen category of patients who were only poor responders. In our study, we took normo-responders in both arms that could have been the reason to get almost equal number of eggs in both groups. While comparing for the primary outcomes pregnancy rate and miscarriage rate were comparable between two groups. Though pregnancy rate was increased in study (Let-FSH) group (36%) than control (33%) but it remained statistically indifferent. Similarly miscarriage rate though decreased (19%) in study group than control (25%) also remained insignificant statistically. These findings were quite similar with other studies like Mitwally and Casper (2005)  where they compared pregnancy outcome in AI cycles with letrozole as ovulation induction agent and studies by Verpoest et al. where pilot study done in IVF cycles with letrozole. But we seriously differ with findings of Ganesh et al.,  who have shown significant increment in pregnancy rate following letrozole in IUI cycles. This difference could have been due to selection of patients. As they took only PCOS patients, letrozole could have worked better. And also total numbers of patients were more in that study while we had relatively small sample size. Reduction of multiple pregnancy rates (7%) in study group than control (17%) also does not show significant difference. Although it shows similarity with results of Mitwally and Casper (2005)'s work  but they used letrozole for ovulation induction and our work was on IVF-ICSI where two embryos were transferred in every patients. This could have been a circumstantial event as well. Our observation on significant (P = 0.01) reduction of incidence of hyperstimulation in study group correlates well with less terminal E2 level and use of antagonists. , Our average cost per cycle was reduced by 34% in study (Let-FSH) group which was corroborated be a previous work done by Sharma et al .,  in a comparative study in IUI cycles. This prospective study, designed to evaluate the efficacy of Let-FSH as a low-cost IVF protocol, involved an average number of patients; however, the results have been encouraging. We have been successful in reaching our objective to modify an expensive conventional downregulated IVF protocol into one in which the cost was reduced to a larger extent, without compromising the rate of success. Adjunctive use of letrozole with gonadotrophin, especially in women where male factor infertility is the sole indication going for IVF-ICSI treatment, may be an effective mean of low-cost IVF therapy. It not only offers a cost-saving stimulation protocol but also reduces unnecessary side effects like OHSS and multiple pregnancies yet maintain a descent success rate. Although, we need more RCTs to come to a conclusion on regular use of such combined protocol. To Dr. B. Hazra for statistical analysis. 1. Mitwally MF, Casper RF. Aromatase inhibition improves ovarian response to follicle-stimulating hormone in poor responders. Fertil Steril 2002;77:776-80. 2. Mitwally MF, Casper RF. Aromatase inhibition for ovarian stimulation: Future avenues for infertility management. Curr Opin Obstet Gynecol 2002;14:255-63. 3. Mitwally MF, Casper RF. Aromatase inhibitors for the treatment of infertility. Expert Opin Investig Drugs 2003;12:353-71. 4. Mitwally MF, Casper RF. Aromatase inhibition reduces gonadotrophin dose required for controlled ovarian stimulation in women with unexplained infertility. Hum Reprod 2003;18:1588-97. 5. Mitwally MF, Casper RF. Aromatase inhibition: A novel method of ovulation induction in women with polycystic ovarian syndrome. Reprod Technol 2000;10:244-7. 6. Mitwally MF, Casper RF. Use of an aromatase inhibitor for induction of ovulation in patients with an inadequate response to clomiphene citrate. Fertil Steril 2001;75:305-9. 7. Goswami SK, Das T, Chattopadhyay R, Sawhney V, Kumar J, Chaudhury K, et al. A randomized single-blind controlled trial of letrozole as a low-cost IVF protocol in women with poor ovarian response: A preliminary report. Hum Reprod 2004;19:2031-5. 8. Mitwally MF, Casper RF. Aromatase inhibition reduces the dose of gonadotrophin required for controlled ovarian stimulation. J Soc Gynecol Investig 2004;11:406-15. 9. Verpoest WM, Kolibiankis E, Papanikolaou E, Smitz J, Van Steirteghem A, Devroey P. Aromatase inhibitors in ovarian stimulation for IVF/ICSI: A pilot study. Reprod Biomed Online 2006;13:166-72. 10. Garcia-Velasco JA, Moreno L, Pacheco A, Guillén A, Duque L, Requena A, et al. The aromatase inhibitor, letrozole increases the concentration of intraovarian androgen and improves IVF outcome in low responder patients: A pilot study. Fertile Steril 2005;84:82-7. 11. Al-Inany HG, Abou-Setta AM, Aboulghar M. Gonadotrophin-releasing hormone antagonists for assisted conception. Cochrane Database Syst Rev 2009;11:1605-7. 12. Vendola K, Zhou J, Wang J, Bondy CA. Androgens promote insulin-like growth factor-I and insulin-like growth factor-I receptor gene expression in the primate ovary. Hum Reprod 1999;14:2328-32. 13. Weil S, Vendola K, Zhou J, Bondy CA. Androgen and folliclestimulating hormone interactions in primate ovarian follicle development. J Clin Endocrinol Metab 1999;84:2951-6. 14. Giudice LC. Insulin-like growth factors and ovarian follicular development. Endocr Rev 1992;13:641-69. 15. Palter SF, Tavares AB, Hourvitz A, Veldhuis JD, Adashi EY. Are estrogen of importance to primate/human ovarian folliculogenesis? Endocr Rev 2001;22:389-424. 16. Mitwally MF, Casper RF. Pregnancy outcome after the use of an AI for induction of ovulation. Am J Obstet Gynacol 2005;192:381-6. 17. Ganesh A, Goswami SK, Chattopadhya R, Chowdhury K, Chakravarty BN. Comparison of letrozole with continuous gonadotrophins and clomiphene-gonadotropic combination for ovulation induction in 1387 PCOS women after CC failure: A randomized prospective clinical trial. J Assist Reprod Genet 2009;26:19-24. 18. Mitwally MF, Bhakoo HS, Crickard K, Sullivan MW, Batt RE, Yehl J. Area under curve of estradiol levels do not consistently reflect estradiol level on day of hCG in COH for IVF-ET. J Assist Reprod Genet 2005;22:57-63. 19. Rizk B, Aboulghar M. Modern management of ovarian hyperstimulation syndrome. Hum Reprod 1991;6:1082-7. 20. Sharma S, Goswami SK, Mukherjee S, Ghosh S, Chattaerjee R, Chakravarty BN. Efficacy of letrozole-gonadotrophin, clomiphene-gonadotrophin and only gonadotrophin in clomiphene and letrozole resistant PCOS women undergoing IUI. Abstracts of the 26th Annual Meeting of the European Society of Human Reproduction and Embryology. Hum Reprod 2010;25 Suppl (1):325.